A new paper published in Environmental Research Letters finds excuse #66 for the 18+ year "pause" of global warming: There's no "pause" if you look at only the one single warmest and coldest days per year. According to the authors and the accompanying editorial, if you use a dataset of extreme temperatures "which is not publicly available" and has data from "areas that don't have many observations" (with extrapolated (modeled) temperatures) and pick out the one single day per year with the highest and lowest temperatures, those sparse one day per year observations are within one standard deviation of the climate model warming predictions. All's good with the climate models since the single warmest and coldest days of the year are within 1 standard deviation of model predictions, except that inconvenient cooling trend in the NH mid-latitudes shown by the blue arrow. All's good with the climate models since the single warmest and coldest days of the year are within 1 standard deviation of model predictions, except that inconvenient cooling trend in SE Asia shown by the blue arrow. 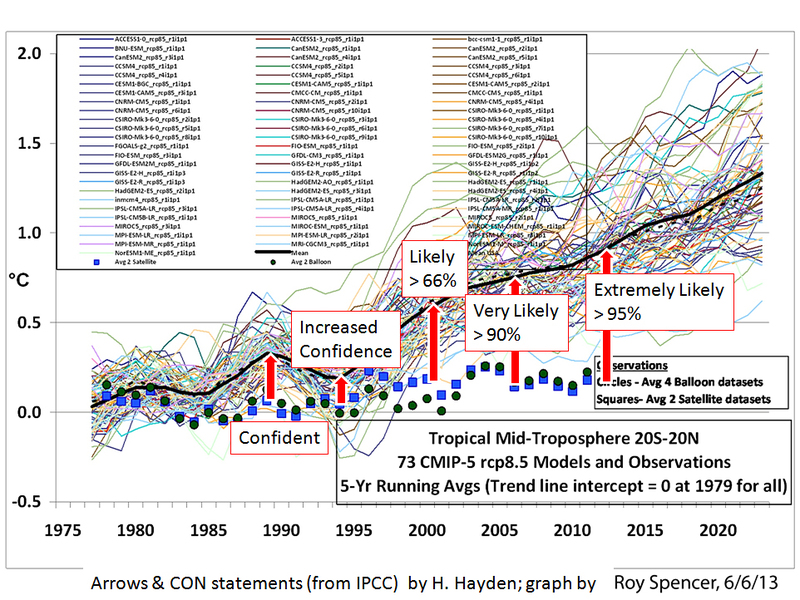 Of course, if you instead look at observations from the other 364 days per year, the climate models are overheated by a factor of 3-4 times and falsified at confidence levels exceeding 98%+, but that shouldn't stop anyone from grabbing at straws and believing in the "faux pause," or that this paper allegedly "results in increased confidence in projections of future changes in extreme temperature." Michael Wehner examines trends in extreme temperatures during the warming hiatus. Sillman et al. 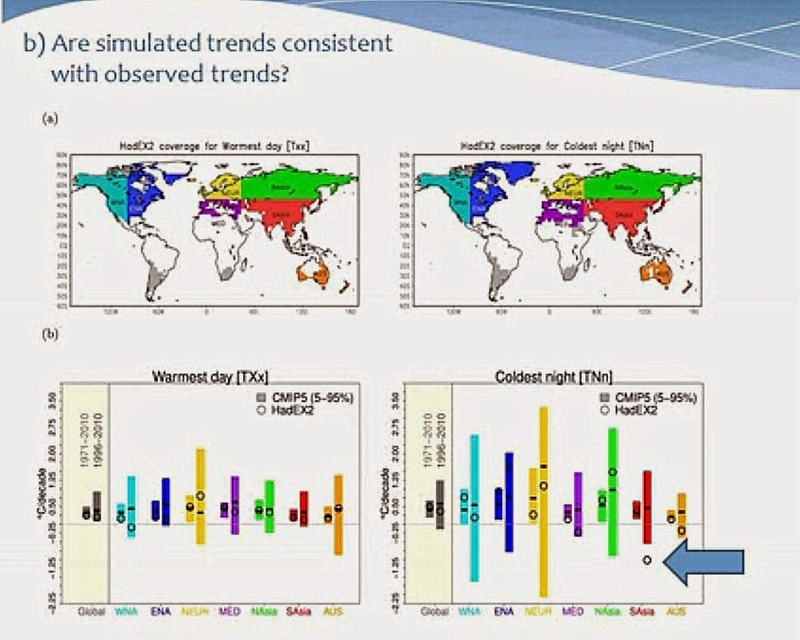 (2014) find that observed trends of extremely hot days and cold nights are consistent with the current generation of climate models. Short periods of localized decreases in these extreme temperatures are not unusual and the Sillman et al. results increase confidence in projections of future changes in extreme temperature. Recent short periods of reduced rates of the increase or even a decrease in observed global average surface air temperatures have been used by those who refuse to accept the reality of anthropogenic climate change to argue that computational and theoretical models of the climate system are invalid and not useful tools for projections of the future. David Easterling and I first showed in 2009 that such arguments are a specious cherry picking of the natural variability inherent in the climate system (Easterling and Wehner 2009). Since then, a great deal of attention has been focused on the period since the very high temperatures of the El Niño year of 1998. Often referred to now as a "hiatus" in warming, the search for the causes of this recent reduction in warming has increased our knowledge of short-term fluctuations in global mean temperature. While the issue is not fully settled, some combination of natural variations in the climate as well as unforeseen changes in external forcing factors, including volcanic and human aerosols (Solomon et al. 2011, 2012, Santer et al. 2013) are the likely mechanisms behind the hiatus. It follows that if there is a change in the rate of global average warming, there are likely some alterations to the rate of change of other aspects of the climate system. The present study by Jana Sillman and co-authors (Sillman et al. 2014) examine recent changes in the temperature of both extremely hot days and extremely cold nights. Both of these measures of extreme weather have warmed from 1971 to 2010 over most of the land regions where high quality observations exist. Increases are larger and more likely to be significantly different from zero for cold extremes. For hot extremes, they find that significant increases are confined to the Eurasian land mass. However, examination of changes in extreme temperatures over the much shorter period of 1996 to 2010 reveals a different pattern of a mix of coherent regions of increases and decreases for both measures of extreme temperature. 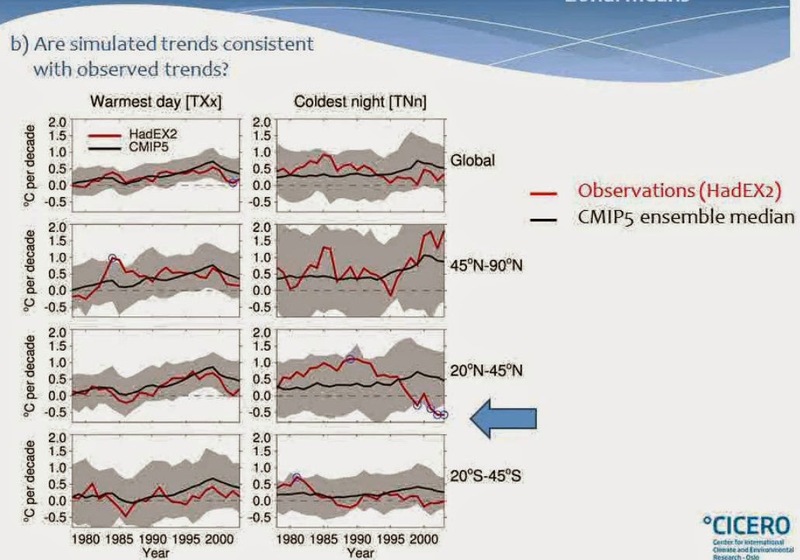 Few of these observed changes are significantly different from zero over this short of a time period indicating that natural fluctuations at this time scale are of the same order of magnitude or larger than anthropogenically forced changes over this period. As with mean temperatures (Santer et al. 2011), longer periods are required for the human signal in extreme temperatures to arise from the natural noise of the climate system. This interplay of the time scales and magnitudes of natural noise and externally forced signal make the evaluation of climate models and their projections of the future difficult, particularly on decadal time scales. The multi-model average change in both types of temperature extremes is positive at nearly all locations of quality observations over both the long and short periods considered. Such an apparent discrepancy is often incorrectly used to discredit the accuracy and usefulness of climate model projections of the future. However, such an interpretation of model simulations is fundamentally flawed as the observed climate system has followed a single path in a complex space of many different synoptic possibilities whereas a multi-model average is an integral (although somewhat incomplete) over these possibilities. Sillman and co-authors have very carefully examined 74 individual simulations from 27 of the most recent climate models and conclude that the observed globally averaged temperature changes in hot days and cold nights over both the long and short periods are consistent with a 5–95% range of the multi-model ensemble. They go on to analyze seven sub-continental regions and find that with one exception, the observations and models are also consistent by this same measure of confidence. The one exception is an observed large decrease in south Asia in cold night temperatures over the period 1996–2010. While most model realizations simulated increases for this extreme temperature metric in this region from 1996–2010, at least four model runs from four different models simulated extremely cold night temperature decreases. Remarkably, one of these simulations produces cold night temperatures of similar magnitude as observed despite the finding that "the recent 15-year period largely represents a highly unusual (extreme) realization of climate as part of internal variability". Unlike the recent hiatus in the warming of average temperatures, where an appeal to unforeseen external forcings appears to be necessary to fully reconcile observed regional cooling with model simulations (Fyfe et al. 2013), most, if not all, observed recent downward regional trends in the temperatures of hot days and cold nights can be explained by the larger natural variability of these metrics of extreme weather. The CMIP5 models are far from perfect, particularly in their characterization of regional natural variability on decadal scales and their response to short-term variations in external forcing. And the hiatus in average global temperatures has necessitated a reduction in the lower bound on climate sensitivity (Otto et al. 2013). Nonetheless, the consistency between the multi-model ensemble and the actual climate, demonstrated by Sillman and co-authors, enhances confidence in suitably scaled multi-model projections of future long-term increases in expected temperature extremes. This work was supported by the Regional and Global Climate Modeling Program of the Office of Biological and Environmental Research in the US Department of Energy Office of Science under contract number DE-AC02-05CH11231. The author wishes to thank David Easterling and Dáithí Stone for their useful comments. For references see "A temporary hiatus in warming of extreme temperatures is not unusual, nor inconsistent with model simulations of human-induced climate change" at environmentalresearchweb 's sister journal ERL . In short, they are saying if we makes stuff up there is no pause.